The answer to this question, in short, is everything. The British Army prides itself on the quality of its JNCO’s. To achieve this reputation, these young leaders go through some of the most demanding military training courses in the world. You only have to look at the number of students from UK allies that attend the likes of Junior and Senior Brecon. Having completed a fair few of these courses, I can vouch for just how arduous they are, but the aim of this article is to emphasise that those courses are only the beginning. I’m talking about this not only from a personal perspective, but development of others too. Be under no illusion, passing any battle course, or any other promotional course for that matter, is a great achievement and you should be extremely proud of yourself – but it doesn’t end there. The courses have given you a foundation, a strong foundation, that you now need to build on to become the leader/commander you both want to be and are expected to be. Do not fall short of thinking that because you have passed the course, you know everything. You don’t. Lean heavily on those around you. Ask questions. Observe them; how they teach, how they lead, how they discipline and how they inspire/encourage and take all of what you feel is good and add it to your own leadership ‘arsenal’. By all means tweak and change things to suit you, that’s what development is all about, identifying what makes a better you and implying it! Now, look at all those around you, both those of the same rank and those who you now lead. They will look to you for decision making, but they will also have some pretty impressive ideas themselves, don’t be afraid to take their advice and ideas, not only will it show your people you are prepared to listen, but it allows you to understand how your people think! It is your job to develop those individuals as much as you are prepared to develop yourself. Be the person they can and want to learn from first and foremost, then encourage them to self-develop as much as you are. There are heaps of things out there, whether that’s a course through military education services or pushing them in the direction of an article such as this one. Military social media is gathering some real speed and can add real value to both personal and team development. Use it! If there is one thing I think every junior commander should be taught, it is the difference between confidence and arrogance, and the fine line between the two, that can either make or break a good leader. Be confident in yourself and your ability, always. But always remember where you’ve come from and appreciate the experience of others. Never think you are above learning and developing yourself. Take criticism, understand what criticism is and use it to your advantage to become a better you! As a newly promoted LCpl, I can openly admit to falling short of such humility – and I use this story regularly when I speak to those I find myself responsible for. I was very fortunate to fall under the guidance of a very capable and experienced Section Commander who quickly identified my short comings and told me this: “The minute you learn how to be humble, will be the minute you’ve realised you’ve missed out on a lot of learning” (This was said amongst other things that were said at a volume that would, in this modern army, require hearing protection). But he was completely right, I had thought myself ‘fully learned’ and therefore had missed out on countless opportunities already to learn and self-develop. Be humble, encourage humility, and you will undoubtedly surround yourself with honest, highly motivated individuals of all ranks, who will work relentlessly to make each other better. Be clear in what you want to achieve, both as an individual and as a team. Identify strengths in each of your soldiers – AND USE THEM. Give your soldiers goals. Challenge, encourage and support them in achieving those goals, and most importantly; make them relevant! Understand your role. What is your job, both in barracks and on operations? Make sure your self-development works towards making you better at your job. Make sure everyone you’re responsible for understands their role. Give them purpose, in all that they do. Yes, the army can throw menial tasks anybody’s way, but can you use those tasks and link them to a higher purpose or way of development.? Situational awareness (not just operationally). I love this phrase, because its important. Remember where you are and what you’re there to do. What effect will your decision have on future tasks and on other people. Always remember, regardless of what you’re doing, where you’re doing it or who you’re doing it with, we all fight the same war and you should think of any second order effects from your decisions. Think; “So What?” and don’t be afraid to ask “Why?”. I hope this short article, for all, has at least given you one thing to think about when it comes your own personal development. In summary, lead by example, challenge, motivate and encourage yourself and your soldiers and always, always remain humble. The Section Commander is a JNCO in the British Army. He's completed The Section Commander's Battle course, The Platoon Sergeant's Battle Course and Multiple Operational Deployments. 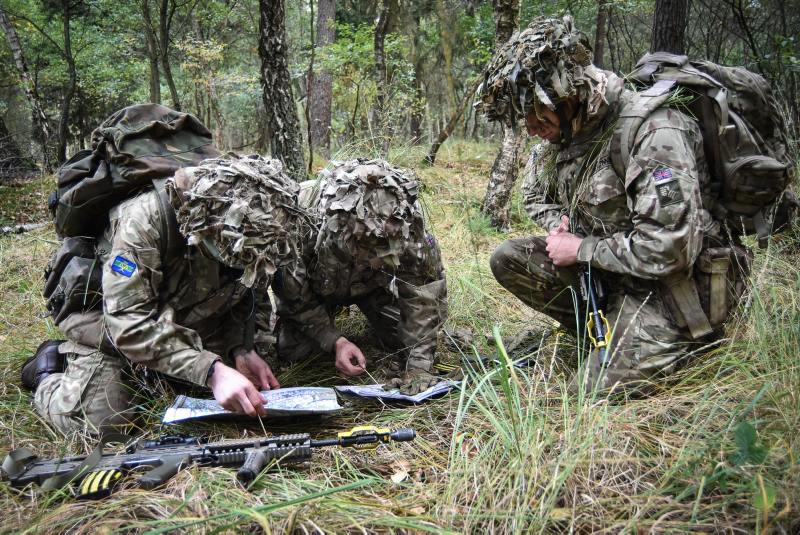 Junior NCOs are the back bone of the British Army, We're proud to have our first article from a junior leader.